Within 250 miles of Fremont, OH. Did you know that the fastest that your swimmer is ever moving in a race is after the start and after every turn? 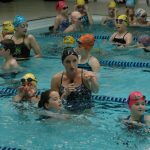 At this high performance swim clinic, there will be one session focusing on starts and another focusing on turns. American Record Holder and National Champion Ali DeLoof will teach your swimmer how to maximize their speed at these key points in a race and how to maintain that momentum for longer. They will be joined by National Champion Emily Klueh on Sunday! Sign up for one or SAVE by signing up for BOTH sessions for your swimmer’s age group! Scroll down to read more about the curriculum at this clinic. SAVE by signing up with early bird pricing! Prices will rise as we get closer to the clinic. Ali and Austin will be in the water for two sessions designed for swimmers of all ages and ability levels. Sign up for one or both sessions for your age group! The start is the fastest part of every race! At these sessions, American Record Holder Ali DeLoof will work with the participants to maximize their speed and power off of the block and then carry that momentum into a tight streamline and powerful underwater dolphin kicking! STARTS: Set the tone for a great race with a powerful, streamlined and fast start. There are countless intricacies to performing a great start and you only get better with practice. Ali will teach each participant how they should set up on the block and then explode forward for maximum speed and power into a tight streamline. He will also share stories on how she found time to practice and improve her start both in and out of the water for continuous improvement! STREAMLINES: Staying streamlined, tight from fingertips to toes and head in line with your spine, is the simplest way to maintain speed. Ali will reinforce to you why swimmers should NEVER take streamlining for granted so that they can maximize their momentum off of every start. UNDERWATER DOLPHIN KICKING: Not a single great dolphin kicker kicks from their knees down! Ali will instruct your swimmer on how to engage your kick from the core, utilizing your chest press and hip drive to create a fluid undulating motion. The fastest swimmers in the world dolphin kick off of their walls, learn how to get more speed and power out of every kick! Most age group swimmers add in extra movements on their open and flip turns that slow them down and prevent them from carrying their momentum through the turn! Even at Olympic Trials we see many very fast swimmers who miss making finals and even the Olympic team because of their turns! The turn is an opportunity for a swimmer to actually GAIN MOMENTUM, when in fact most swimmers actually slow down. At both of these sessions, American Record Holder Ali DeLoof and Emily Brunemann Klueh will be in the water teaching your swimmer how to improve their turns so that they can drop time! FLIP TURNS: Your swimmer will learn how to carry their momentum through the turn to get in and out of every wall faster. Swimmers will practice accelerating into the wall with long strokes and then using their core and arms to get through the turn. They'll practice planting their feet on the wall for a powerful pushoff in the perfect streamline. Ali will give the swimmers drills and exercises to help them master this athletic skill now as well as in the future! OPEN TURNS: Think about the open turn differently! You don't turn around; you spin backwards! Spinning backwards enables you to carry momentum into the pushoff. Turning around is a process of stopping and going again. We're going to teach you how to cut a lot of time on this turn! Swimmers and parents are invited to ask Ali and Austin questions during a Q&A session. Gain insight into their training regimen, diet and nutrition, and recovery tactics. Observe Ali and Austin swim at full speed and demonstrate a progression of perfectly executed drills to achieve powerful, efficient and fast swimming. Practice what you've learned by taking your stroke to your top speed with two of the best swimmers in the world! Hold on to your form while having the opportunity to challenge yourself. Take a photo while wearing Austin and Ali's medals, get autographs, and a gift from TYR Sport!